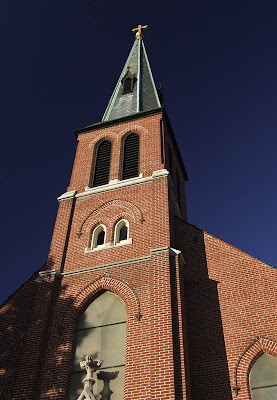 HERE ARE PHOTOS of Immaculate Conception Church, in Arnold, Missouri. The church is about 19 highway miles southwest of downtown Saint Louis in northern Jefferson County. 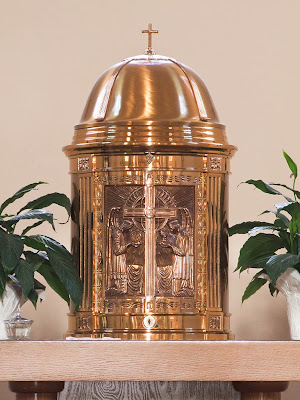 The parish was founded in 1840 by fourteen families who had emigrated from southern Germany and Alsace-Lorraine. Bishop Joseph Rosati sent Fr. J.P. Fischer, an assistant to the Cathedral of Saint Louis, to serve these immigrants. Fr. 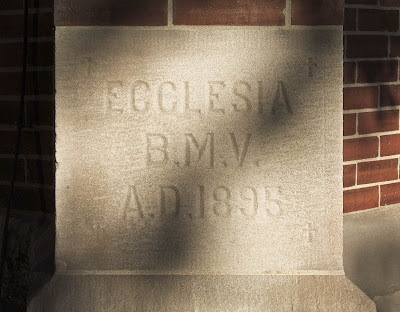 Fischer purchased 160 acres of land for the parish in 1839, celebrated the first Mass in 1840 and directed the building of the first church, a log building, in 1842. A stone church was built in 1851, and the present church in 1895. 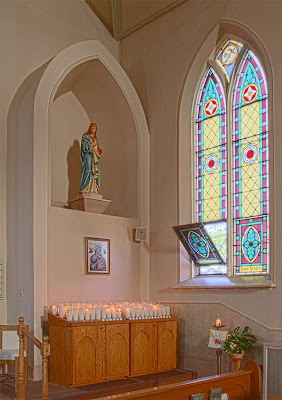 The church was redecorated in 1995; the church and its new altar were solemnly dedicated (consecrated) on October 13 of that year, one hundred years to the day from its original dedication as a church. 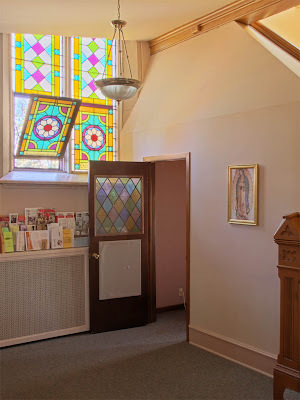 The parish was served by diocesan priests from its foundation until 1991 when the Capuchin Franciscans assumed administration for the next ten years. In June 2001, the Archbishop of St. Louis again appointed a pastor from the archdiocesan clergy. The parish school was begun by a group of parishioners in 1857 with the rectory serving as the school building. A log school was built in 1860 and a stone school in 1871. Franciscan Sisters, who later founded St. Anthony’s Hospital, taught in the school from 1883 until 1889. Ursuline Sisters arrived in 1893 and remained until 1993. A brick school building was built in 1922. The present school building was dedicated in 1957 and an addition was added in 1984. In 1988 the school combined with St. David’s parish school to form Holy Child School. 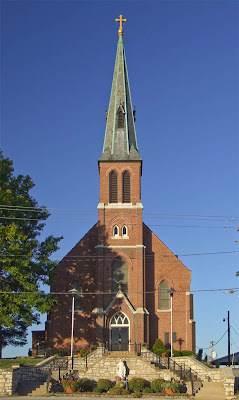 The parish school is probably the oldest parochial school in the Archdiocese of St. Louis. [T]he church is 110 feet long and 40 feet wide. 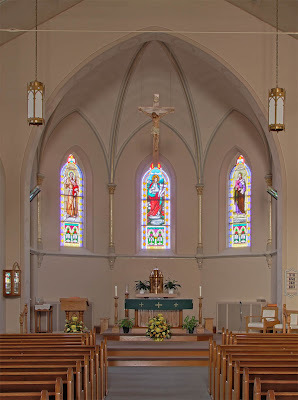 It is 34 feet high on the inside and the steeple rises to a height of 121 feet There are 19 rows of pews in the nave and the main aisle gives the brides and their fathers (among others) a walk of 67 feet from the vestibule doors to the first step of the sanctuary. Its seating capacity, counting the choir loft, is 330 adults but holds 385 adults and children mixed. Three steel rods, installed in 1926, span the nave to help relieve problems due to the settling of the foundation, a problem that has plagued the church since it was built. 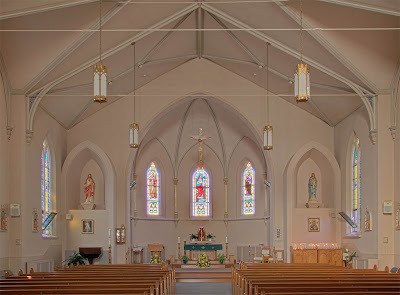 According to the 2007 ecclesiastical census, this church has about 2,612 parishioners. Jefferson County is growing quickly in population, and there may be a need for a larger church in the near future. 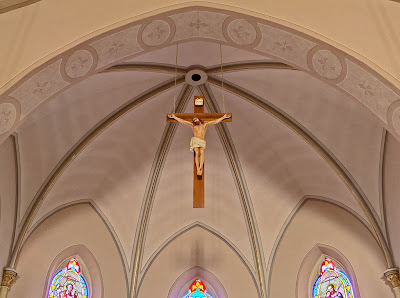 The crucifix is suspended from the sanctuary arch. The area which is now Jefferson County was sparsely settled by Europeans in colonial times, and was known more for the wild men and beasts of the forest. One of the first European settlers in what is now known as Arnold was Jean Baptiste Gamache, who in the service of the King of Spain, operated a ferry boat on the Meramec River for the King's Trace or El Camino Real (now Telegraph Road) between Saint Louis and Sainte Genevieve. The Meramec Settlement here, founded in 1774 by John Hildebrand, had a population 115 souls of French and Indian descent by 1799. They lived by hunting and fur-trapping and—like most of the local French—had a distinct disdain for farming. Indian raids in the 1780s and 1790s made living in this area risky, deterring settlement. In more recent centuries, the rugged Ozarks terrain of the county deterred both farming and suburban tract development. Historical settlements in the county tended to be located on the Mississippi River for easy transportation. Now the northeastern corner of the county, which includes Arnold, is booming with new real estate development. However, much of the county remains a forested wilderness. The county was organized in 1818 and was named in honor of the former President Thomas Jefferson. Its county seat is Hillsboro, which is the English equivalent of Monticello, Jefferson's home. Jefferson was greatly admired by many of the early Scots-Irish descended American settlers in Missouri. The entirety of Arnold was at one time the property of Antoine Pierre Soulard, Surveyor-General for Spain and later for the Americans. Soulard is French for 'drunkard'. The town of Arnold was incorporated in 1972, merging with four other communities. 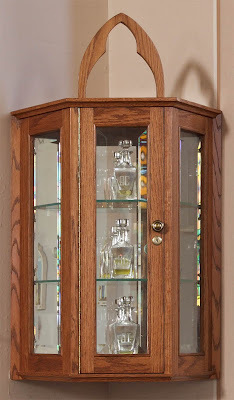 It was named after a local postmaster. Click here for a 1915 photo. Two of the stained glass windows in the sanctuary: the resurrected Christ and Saint Anthony of Padua. 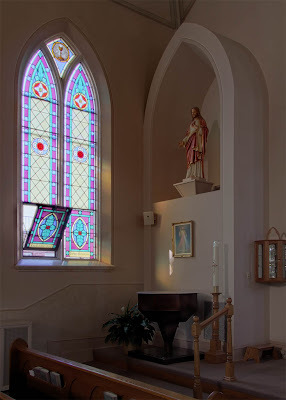 Statue of the Sacred Heart of Jesus is above the Divine Mercy picture and the baptismal font. 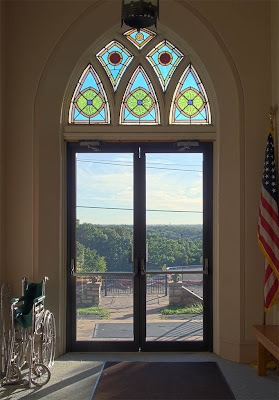 The side-widows are mainly decorative, but note the Eucharistic medallion in the top pane. 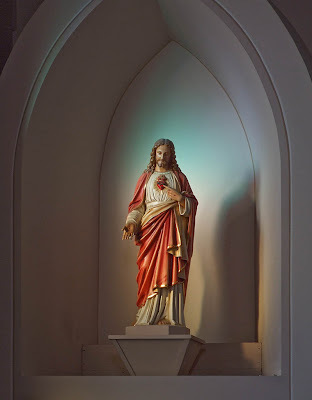 Statue of the Sacred Heart is nicely lit from the colored glass of the windows. 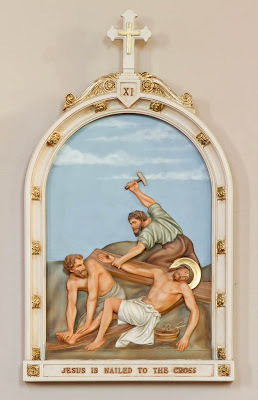 XIth Station: JESUS IS NAILED TO THE CROSS. The church sits on top of a hill, and this view shows what appears to be an extensive forested area. However, there is much new construction going on below the church. 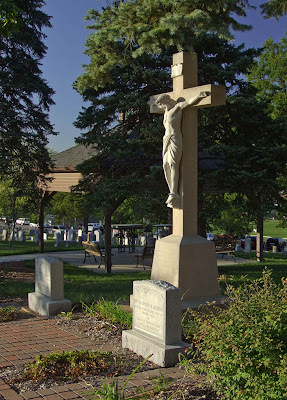 The first known burial in this cemetery dates from 1848; the early graves were not recorded properly and they had poor monuments which deteriorated quickly; part of the oldest section of the cemetery apparently now lies under a parking lot. 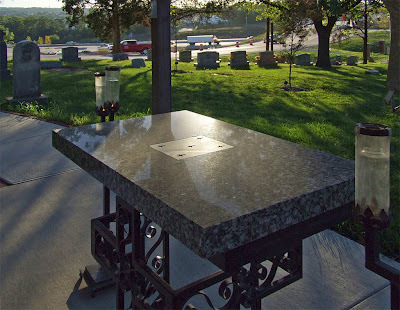 About 20% of the parishes in the Archdiocese have cemeteries. Altar in the outdoor cemetery chapel. Note the small altar stone embedded in the mensa. The parish school teaches children from grades pre-K through 8. Mark, thanks-- the Church of my childhood. The Resurrected Jesus window is new, and the style is a bit strange. 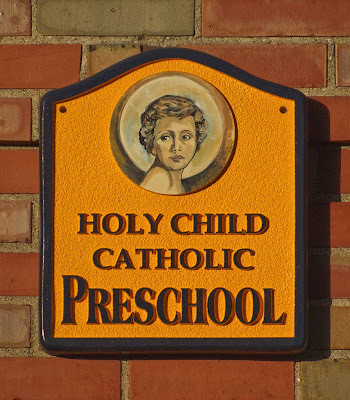 That Holy Child placqe looks unsettling! It is a pretty little Church, or at least, could be. I like your photography, but I like the 1915 photo best! Hopefully someone soon will begin the restoration of the sanctuary to those days, so the extraordinary rite will have a lovely home. I was raised in this church and the church has definitely been painted too white! It used to have "Marian" blue over the altar with stars. I wish it was painted it's original colors.